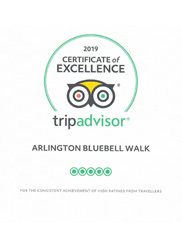 The 47th Arlington Bluebell Walk & Farm Trail will be open from 11th April to 19th May 2019. The list of charities involved each day can be found on the charities page. Planning to visit? 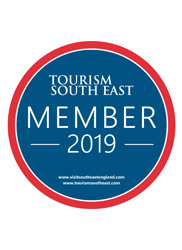 We suggest you read the Visitor Information page to make the most of your visit. No need to book, just turn up! 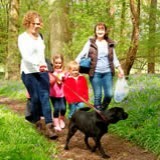 Since 1972 seventy-four local charitites have raised £1,057,096 by helping make the Bluebell Walk possible. Find out which Charities were involved in 2018. The accessibility page aims to accurately describe the facilities and services that we offer all our visitors. 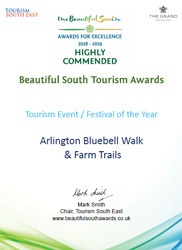 Since 1972 the Arlington Bluebell Walk and Farm Trail based at Bates Green Farm has developed into seven interesting walks over three working farms. A circular walk of 800 metres or half a mile in Beatons Wood has been made suitable for wheelchair users. This is where you see white anemones followed by the vistas of bluebells, established over centuries. 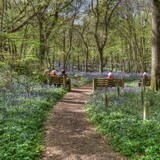 On this walk there are seats for you to enjoy the peace and tranquility of this oak and hornbeam ancient wood. Along the walks there are signs illustrating the flora and fauna of the countryside for your information. 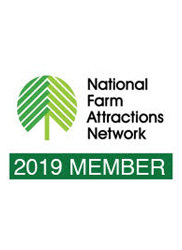 At neighbouring Parkwood Farm (2.75 mile walk there and back), milking of the large dairy herd can be seen from a special viewing gallery every afternoon between 3:00pm and 5:00pm. At Primrose Farm there is a horse livery, also this is where the young cattle are reared. Of course you can, but you must always keep your dog on a lead please. This is necessary to stop dogs running through the bluebells and disturbing the wildlife and frightening the farm livestock on the other walks. Three `Dog Poop` bins are situated at the entrance to the Wood, both ponds, also one at Parkwood Farm and the Car Park. 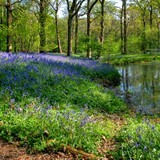 We also have a bag dispenser at the entrance to the Bluebell Wood.We understand that some dog faeces may contain the parasite Neospora caninum, which is known to cause abortion in cattle. We have picnic facilities in the shady corner of the large car park field. We ask that you do not picnic in the Bluebell Wood please. Are mountain bikes allowed on the walks? 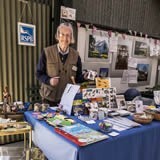 Sorry the Walks are only open to walkers, and those who have accessibility difficulties, therefore needing to use wheelchairs or mobility scooters. What public transport is available? We are a 3 miles walk from Berwick Station. Again a 3 mile walk from the bus stop at Wilmington. Train to Polegate Station and taxis are available, their telephone 01323 484444. 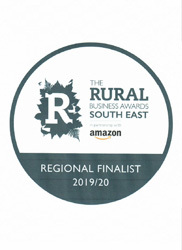 Bus journey to Hailsham and taxis are available, their telephone 01323 844464. Can we get something to eat? Each day the Duty Charity supplies what is listed on the Food Menu. Seating in both the Bluebell barn and on the Sun Terrace. Highchairs available.